Salvation for the dead and Baptism for the dead are two of the distinctive doctrines of Mormonism that separates it from historic Christianity. Yet, interestingly, the Book of Mormon is silent about salvation for the dead and baptism for the dead, and the Latter-day scriptures that explicitly mention these subjects are largely interpretations of a handful of Bible passages (two in particular — 1 Peter 3:19-20, 4:6 and 1 Corinthians 15:29). Thus, the real foundation for the LDS Church's doctrine of salvation for the dead is its own unique interpretation of these passages. This paper provides a summary of biblical teaching on the subject of our eternal destiny. 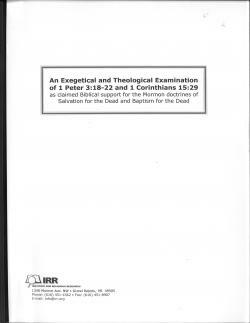 It then goes on to examine the Mormon interpretations of 1 Peter 3:19-20, 4:6, and 1 Corinthians 15:29, and it highlights the major obstacles to accepting the LDS interpretation of these passages, firmly establishing the wholly unbiblical nature of the Mormon teaching.